Community Connections ADRC Team Member (left to right) Eunice Forest, Paul Calta, Matt Santelli, David Bradt, Barbara Bauml and Randy Ip. The Aging and Disability Resource Center (ADRC) team at Pierce County Community Connections has something to celebrate. 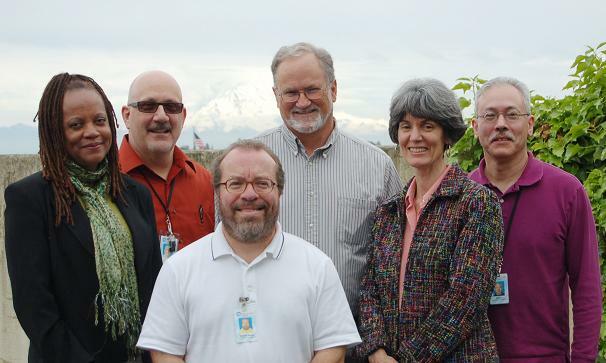 All six ADRC case managers received recognition as Certified Information and Referral Specialists in Aging (CIRS-A). Barbara Bauml, David Bradt, Eunice Forest, Randy Ip, Matt Santelli and supervisor Paul Calta successfully passed the CIRS-A exam. The test measures abilities in the field of Information, Referral and Assistance (I&R/A). It covers a variety of competencies to gauge the knowledge, skills, attitudes and work-related behaviors needed by those working in I&R/A. A service of Pierce County Community Connections, the ADRC provides free assistance to older adults, individuals with disabilities, family members, caregivers, friends, neighbors and professionals. The center offers information, referral and assistance to people seeking to access public and private pay programs and services to help residents remain independent and safe in their own homes for as long as they are able. CIRS-A certification signifies expertise on issues relating to older adults. The certification is administered by the Alliance of Information and Referral Systems, a professional association for community Information and Referral (I&R) and I&R/A providers in the United States and Canada. The ADRC is available by phone at (253) 798-4600 or (800) 562-0332; on the web at www.PierceADRC.org; and at the Community Connections office at 1305 Tacoma Avenue, Suite 104. Log in | 49 queries. 1.727 seconds.